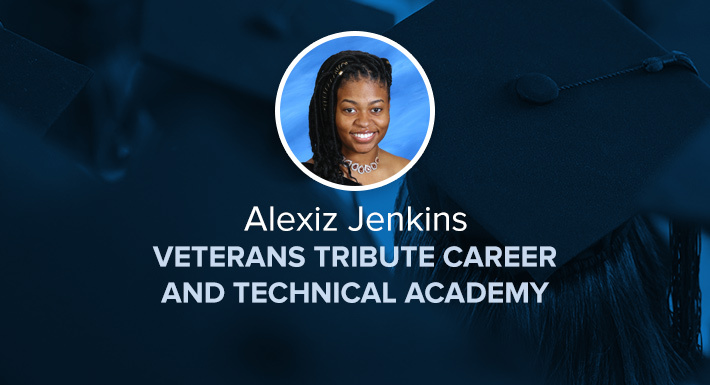 Alexiz Jenkins is Veterans Tribute Career and Technical Academy’s 2019 Star Graduate! Alexiz is by far one of the most influential students on campus at VTCTA. Her desire to succeed is evident in every aspect of her life. She excels academically, personally, socially and in the community. Alexiz is the founder and president of the Black Student Union. She organized a whole-school discussion about race and its importance in student identity as a means for improving the culture and climate on campus – a difficult discussion that Alexiz handled with grace and maturity. Alexiz’s impact on campus cannot be overstated – she has worked to provide a safer, more accepting campus for all students since she first started with us. She plans to continue to work for social justice and equality as she attends Spelman College next year, and we have no doubt she will continue to positively impact the world. Congratulations, Alexiz! We are so proud of you! Visit ccsd.net/students/star-graduates to see more of CCSD’s 2019 Star Graduates.